I received my B.A. in 1974 and spent my last two undergraduate years studying with Allan Bloom at the University of Toronto where we became Platonic friends. I heard much of the history we have just covered (in Parts I and II) in his classes (long before his famous book was published (1987)). However, in relation to his ideas about a university’s purpose, at that time I was in the thick of things and certainly could not then appreciate his ideas from his expansive intellectual breadth. The pressure to accept relativism in many of its forms was in the air and not quite tangible enough for me to recognize it was so pervasive when I entered the university. I had attended private Catholic primary and high schools where nothing remotely “relativistic” was espoused. Growing up (my parents had many Jesuit priest friends from Georgetown University) we often discussed the ethical reasons for making certain decisions, but only in relation to the nonrelativistic “answers” provided by The Ten Commandments and the Catholic Baltimore Catechism. By my observation after high school graduation, I can only agree with Bloom that what was politically popular was definitely infecting university administrations, and, to my mind at that time (but not Bloom’s), for good reasons. However, in the spring of 1970, four students were shot at Kent State University sparking even more political upheaval on and off campus than the years before I attended college (when Bobby Kennedy and Martin Luther King were assassinated in 1968, riots had ensued in various cities and campuses.) Columbia University was closed down by the students themselves in 1968 prompting Bloom to chastise the university for letting violence win the argument. Nevertheless, as apolitical and busy as I was at Carnegie, the Kent State shooting of students by national guardsmen did get my attention! To repeat, my opinion was that the administrations were sensitive to all these political winds for good reasons: to protect students from harm in all directions, from the military on the one hand, from doing harm to themselves or to the university buildings on the other. I later learned that my idea of a good reason for the administration to “give in” to students who were literally promising violence if their demands were not met was not a good reason to Bloom who saw the university as “the” protection against violence as a means of argumentation (in all directions), and a very special protection for the free-speech foundations of the republican democratic regime known as America (see Parts I and II). He thought everyone should be protected to give their side of an argument; so violence itself was anathema to everything a university stood for. If one was going to have National Guardsmen present on a campus it would be for the purpose of allowing vigorous non-violent debate! What universities should be doing is making sure it was safe to have heated discussions, but definitely not giving in to student blackmail of violence, politicians demands to silence students, and especially not allow the military to kill demonstrating students (!) If there was not a safe place possible at the university? The university should be the one closing its doors until it could create such conditions, not the students! Although I did not know it at the time, Bloom spoke out in the late 60’s about how the university was abandoning its founding ideals to political correctness and utilitarianism; but my personal experience was colored by my own observations. What I saw in the university was “normal” for me. I got the idea that, “The times they were a’changin;’” but I had no appreciation then for just how much change was happening in the structure of the university itself. I should add that I was much too busy studying and working to participate in any of the demonstrations at Carnegie except for the one in Washington, DC, after Kent State (for which I had my car taken away from me by my father as punishment for being so stupid as to put myself in harm’s way (and to drive from Pittsburgh to DC without his permission).) I spent the final few months at Carnegie deciding that I needed to change majors because the theater life was great, but my favorite class was one where we studied the history of ideas. I discovered that I loved reading books and discussing their ideas and eventually transferred to St. John’s College (Great Books). I doubt there could be a more dramatic contrast in a college experience than that of Carnegie-Mellon (many thousands of active students in diverse separate departments and sub-universities) in contrast to the tiny (400 students total, 100 per class) college of St. John’s where I felt as though I finally understood what an “ivory tower” meant. I learned Greek, studied the classics and rarely even read a newspaper! There were some small demonstrations against the Vietnam war, but I was far too busy studying to pay close attention. Interestingly, I was becoming much more aware of the history of political ideas and, in fact, probably gleaned more insight into what was important in a republican democracy through my studies at St. John’s than if I had participated in the then continuing political demonstrations. 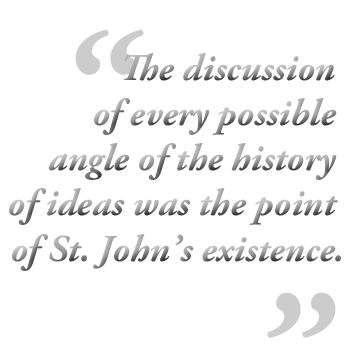 The discussion of every possible angle of the history of ideas was the point of St. John’s existence. Based on the Oxford model, we not only read an astonishing number of books (many classics in the original Greek), but we orally defended a thesis on topics in those books in a paper that required reasoned argument every week! I was well on my way to appreciating what was the purpose of an education. Toward the end of my second year at St. John’s, I attended a series of lectures that Bloom gave at the college which were so effective as to make me want to study more classes with him and I transferred to his college in Canada in 1972. Bloom was then teaching at Victoria College (now Victoria University) at The University of Toronto. He lectured to us that he felt the university was losing sight of its basic function as a safe place to speak one’s mind outside of the reach of quotidian, business or political concerns (Bloom, 1987, pp. 313-382). I did not think that St. John’s was like that (at least not in any way I had observed), but I began to experience what Bloom describes in his book in a kind of surreal way at the University of Toronto: a very peculiar anti-intellectual bias was growing on the campus. 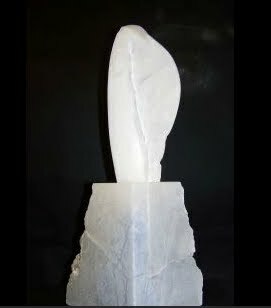 When I would argue from Plato or Aristotle (or other philosophers or political scientists whom my fellow students knew little about), my co-students would respond that I was just stuck in a conservative mindset, that I thought too much about the reasons for things, that all sides had something to offer, that there were no answers, “everything was relative.” Bloom noted in his book––but I saw it in action––that student rebellion against any authority, including the authority of reason, was a contributing factor to the university’s demise (pp. 313-382). Eventually, I saw where Bloom was heading in his book and although not all universities and colleges have succumbed (St. John’s being a special “outlier”) students do not know much about philosophy now because the university did allow itself to be compromised as to its core reason for existence. All these years later, even most of the professors who have grown up and been educated in the new university milieu, no longer care about philosophy nor the ultimate purpose of an education. They know what a university education is for: getting a job. No need to ask questions (echoing Diotima’s point to Socrates about the difference between the wise sophists and the lovers of wisdom (See Part I)). And, for most academics personally, the purpose of the university is also about getting a job, preferably a tenured position within the university. End of discussion. I was especially lucky to have studied at St. John’s College (Great Books) and The University of Toronto where a “democracy of the disciplines” (p. 337) had not yet taken hold. I knew that some ideas were more important than others. The Philosophy Department was still at the top of the pantheon of disciplines. When I was a student, I was not treated as my own children have been in their attempt to navigate their universities, namely, to a smorgasbord of educational choices that hide any overarching vision of where the academic departments come from or what discipline might be more valuable than another. Most seriously at this point in history, the university cannot articulate to my children what an education is for or “what an educated human being is” (p. 337) other than that if you want to eat, you'd better get a B.A. (You can be sure my children will not listen to their mother’s ideas on this subject.) 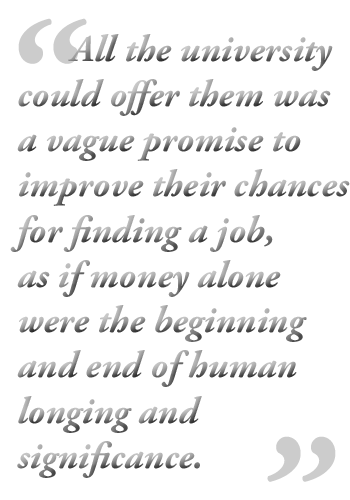 All the university could offer them was a vague promise to improve their chances for finding a job, as if money alone were the beginning and end of human longing and significance. As my children enter their thirties, they have begun studying philosophy, wondering about the meaning of life and about many of the philosophical questions such as whether some political regimes might be absolutely better than other ones (as, for example, a republican democracy might be better than a theocracy). They are beginning to wish they had studied such things when they had the chance. They are trying to catch up but, as everyone knows, life can get in the way. One consequence of no longer being able to present a rationale for the university other than economic value is that a “distinction between the profound and the superficial” (Bloom, p. 338) is almost impossible for students to achieve. Now that I teach college myself, this inability becomes ever more obvious: many students receive their diplomas and tell me they have a feeling that their educations lack depth. Something is missing. They are not sure what that something is. 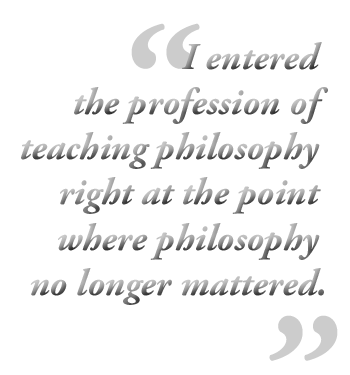 The paradox of all this for the teachers of philosophy is that students now take philosophy as a requirement for that job-getting degree, but as a vestigial and irrelevant exercise. (Need one humanities course. Check √.) Prior to taking a philosophy class, students cannot see the purpose nor importance of the subject in the same way students prior to 1960 could, especially because back then the philosophy department had the most power and authority in the university. How incongruous that students cannot obtain good jobs without getting the university degree that philosophy invented––and for the best jobs they still need to become a Doctor of Philosophy––all the while not knowing philosophy’s history or significance! Finally, and most tragically, we are avoiding the huge beast in the room, something I did not realize had become so enormous until I was a college teacher myself, thirty years after studying with Bloom (although he predicted what I am about to describe would happen). It seems that as the universities gave in totally to the public opinion machine, they bought into cultural relativism so much that these inanities became truisms: one religion could not be better than another: that shows prejudice! One culture could not be better than another: that is a value judgment! It is a terrible legacy for our students! They are not permitted to have any thoughts at all! Why do I make such a dramatic statement? Because all thought requires choosing one idea as better than another from the most basic intellectual questions (What is 2 + 2? ), to the most profound (Why is a democracy better than a theocracy?). If one is inculcated with relativism, one has to stop thinking in order to be politically acceptable. From the American point of view, considering that freedom of speech is most surely undergirded by the freedom to think––the basic civic right that undergirds all others in the American Bill of Rights––the University’s love-affair with relativism is undermining the basic freedom of America (one of Bloom's repeated arguments)! What a catastrophe! And it gets worse. As universities turn out students who no longer appreciate that there is any value other than money, the universities themselves start to be rated by how much money their degree is “worth” to their “customers.” As the costs for the university enterprise rise to astronomical heights (because of the rising costs of land, buildings, laboratories, classrooms, electricity, administrators, staff) and corporate interests and politics enter the scene––a sense of panic and existential threat cause all sorts of “remedies” that often exacerbate the problem and hide the culprit. College Presidents are being wooed like CEO’s of Fortune 500 companies: they must have a Ph.D. (!) and also be rainmakers that bring in more “investors.” Philosophy has been relegated to a dark room in a basement, often added on to the Religion Department (causing Plato and the Enlightenment pioneers of the modern university to turn over in their graves). College teaching itself––the important Platonic relationship (described in Parts I and II of this short history) that is the original purpose of a university education––becomes almost irrelevant as most teaching is parceled out to part-time adjuncts, adjuncts who are now the largest part of the higher education workforce. (Most students, and certainly most parents, do not realize their children’s college teachers are most likely NOT going to be tenured faculty) (Coalition on the Academic Workforce, 2012). The university, following the money, made the choice to focus on the more profitable science and technology fields, so when I entered the profession of teaching philosophy to college students, it was right at the point where philosophy no longer mattered in the university certainly, and, moreover, most certainly did not matter in a community college! It is hard to imagine a more attenuated position for philosophical inquiry than a community college which is itself commonly seen as a place to either a) make up for what one did not achieve in high school; or b) pay lower tuition for two years of college then transfer to a university; or c) get a certificate for some skill so as to (yes, the same goal as the university) get a job. There is anecdotal evidence that community college graduates actually are making more money than university graduates. What is especially nice for me is that there is not even the pretense in a community college (as there might be at a university) that we are eventually going to get to more profound things. In the strangest way, this scenario may have made my experience all the more valuable because, essentially––as long as I made no waves and students were happy––no one really cared about what I did! If the students (customers) were happy? The college was happy. I was able to experiment to my heart’s content and students loved my philosophy classes. Costs of education have been rising for a long time. And the reasons for that rise are a subject for debate. But when the Internet arrived on the scene, Enter the online course. Distance learning had been going on at least since the 1940’s (possibly earlier), but after the Internet, at least by the 1990’s, college teachers were attempting to create online courses, many without any idea of what these courses should entail. Things were getting messy. The entire field of online pedagogy was still new (even though MIT had been working on the Athena program to develop uses for the computer in teaching since 1983). Many teachers without even basic computer training, much less any vetting by administrators, created online courses that may not have had much substance to them. My own son took a course at a major university in 1999 that was called “online” and consisted of (a) reading the expensive textbook written by the teacher and (b) taking a final examination online, period. Tennessee was one of the first States to wake up to the possibility for online course abuse. To remedy that possibility and to discover what worked best when teaching online, it created what is now named the Regent’s Online Campus Collaborative (ROCC). The idea was simple: all the community college admins (and now some of the Tennessee universities) would vet one another’s online offerings so as to ensure that the courses were comprehensive and at the least the equivalent of land-based courses. By requiring a collaborative evaluation of courses by committees made up of the Deans of the varying accredited colleges, they would also make it possible for students to transfer course credits among all the colleges without concern that one online course would be less valid than another: all would be evaluated iteratively by the varying colleges to ensure quality so that––across the state––if one took an ROCC course, one could be sure it was (a) well designed; and (b) acceptable for academic credit at any other institution in the state. Proving that an online course was as good as a land-based one was pretty easy to do for a course that required “the right answer.” Students could even be brought to take examinations with their “land-based” peers and––if they proved to be able to get the same grades or better––they validated that they had learned the equivalent content. Life was good. But what about essays? What about writing? What about logical thinking? What about critical thinking? What about philosophy? 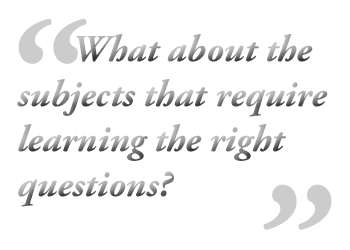 In other words, what about all those narrative subjects that require something more than “the right answer?” What about the subjects that require learning the right questions? My friend essentially dared me to enter the contest for the course design for philosophy that ROCC was spearheading. I won the contest (!). And, as the clichéd saying goes, my fate was sealed. Over ten years later, I now have personal experience that an online course can be as good as a land-based one, maybe even better than the courses I attended at the very expensive and famous universities and colleges I attended; or also better than the courses I had taught in a classroom. The reasons for that are an essay for another day. The point is that students were able to develop a Platonic relationship with me (yes, online) and were willing, eventually, to examine their prejudices and their opinions. The course was a great success leading to over 50 sections in some years and involving students from around the world. Jumping back to the theme of this history, where has The University been and where is it going? Are universities going to survive if they do not know what an education is for and they do not have much faith in philosophy? How are they going to recreate an environment as robust and innovative as that which produced science itself? Can we go back to the original plan for the university now? Is it too late? Is the one place that was the bastion for intellectual freedom going to turn into one more arm of corporate sponsors? 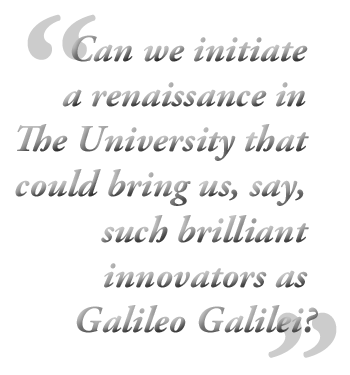 Can we initiate a renaissance in The University that could bring us, say, such brilliant innovators as Galileo Galilei? Oddly, the economic disasters that most universities face might just be the key to such a renaissance (rebirth). Once it is clearly understood that such gimmicks as MOOCs are ridiculous vehicles for teaching anything (unless one is already well educated, in which case MOOCs are at least as good as the Internet itself), the innovation in online education is that it is possible to connect teachers to learners for far less money than ever before. I have done the experiment myself and so I know that it can work for philosophy with the right course design. If we can bring philosophy back to its rightful place in the university, we might have a chance of allowing the kind of thought we need to deal with such politically fraught questions as to why theocracies are not conducive to liberty, or other such philosophical questions that are facing America and our world today. As Diotima taught Socrates, searching for wisdom is not an enterprise for those looking for easy answers and certainly we are in a position now to recognize that whatever the university is, it is not going to be “saved” by easy answers. The question that needs to be asked BEFORE we enter into the Kingdom of MOOCs is why are we requiring our students to get a university education in the first place? I think it is clear that the modern university had a purpose: it was to be “a place where one could speak one’s mind without political or religious consequences and devote oneself to discovering how to lead the best life possible.” I doubt anyone would disagree that that goal is an ideal one. At the very same time, no one that I know, not a single one of my students nor any of the faculty nor administrators with whom I converse would trot out that definition. To a man (or woman), they would say that one goes to college to get a job. And, indeed, one cannot get the most menial jobs without a Baccalaureate. The question we need to ask now is Why? Why do I need to study any of the humanities to get a job as a file clerk? What is about the humanities that makes filing more productive or makes the alphabet more efficient? In other words, what are we doing to our citizens? This essay will get too long if I go into the insanity of requiring students who want a job fixing cars to go into incredible debt to take courses in which they have no interest so as to get a job from which they will then pay off their loans for things that never mattered to them anyway! This is not irony, it is not education, it is cruelty! If anyone had listened 25 years ago and really understood what Bloom was trying to convey, the idea of keeping two tracks of education, one intended to study “the permanent concerns of mankind,” and the other, to prepare for a job, would have been the sensible way to avoid most of the traps higher education has fallen into. Even now, it may be possible to rescue what still has to be understood as a crucial space for a republican democracy because America’s entire edifice is built on the philosophical notion of universal human rights. To remain a free country, someone must have the experience of free thought in order to protect our inheritance of what are the “permanent concerns of mankind!” What would we fight for if we do not understand what our principles mean? To make things even easier to rescue The University, the five tech jobs to have right now are .NET Developer, Web Developer (specific to open source technologies: PHP, Drupal, Java), Network Engineer, Systems Engineer, and Security Analyst (data provided through personal communication with Cassandra Babbington, Managing Director, Technology Services at HireStrategy, ranked the #1 hiring firm in the Washington, D.C. area). All those subjects can be taught online; but, most importantly, all of them have "right answers." Expertise in these technologies can pretty much guarantee that the learner will soon be setting his or her own salary. If we could devise a certificate system for ensuring that students could learn these subjects and become experts in them (as, for example, The Conservatory of Recording Arts and Sciences in Arizona does for expertise in ProTools (Certificates in Sound Engineering)), we would solve a number of these tough problems: provide jobs for those who want them; and start recognizing again that the university has a special place that some of us will want to embrace. First, we should stop conflating the purpose of a university education with getting a job. Those who study the full panoply of subjects may very well get good jobs, but the statistics are not promising (see the White House’s reporting of the dreadful statistics for yourself: http://www.thewhitehouse.gov/education). And guess what? It turns out that online courses are pretty good for teaching technical subjects too (visit Lynda.com for a surprising array of terrific training courses). We have a very long and deep pedagogy for transferring expertise (at least since the 1940’s Programmed Instruction in the U.S.) that works very well and efficiently online. Those savings could be used to decrease tuition across the board and give the university’s main purpose a new birth. There are thousands of other new ideas for higher education, such as becoming professional assistants (what many graduates with B.A.’s are actually doing in their “Internships” after spending tens of thousands (or orders of magnitudes more) for their educations). The possibilities here for addressing the need for telling the university that the emperor has no clothes are many and varied. The politics that will arise if we go in this direction will be fierce IF we do not address up front the value of a university education for those who want and/or can afford one. I’m not talking about a Marxist agenda with the university-educated becoming a class of owners of the means of production; while those on a tech career path are demoted to some kind of secondary class status. Considering our recent history such a result may turn out to be just the opposite. I do not know. I do think that we have enough experience with the reality that people with great ideas come up pretty much everywhere, not just in the university; that we need to hold high schools accountable for inculcating students with philosophies about which they themselves are not aware of the consequences (cultural relativism, for example); that we need to give opportunities to those who do not like to read literature, the chance to become great coders; those who love to work with their hands rather than learn another language, the chance to earn a decent wage; those who love ideas and are willing to fight the good fight to think about them, the chance to attend a university whose goal is to help them succeed in re-discovering the permanent concerns of mankind. We are at a point in history where students at ANY level can make a choice to learn anything (one area where MOOCs may prove most valuable). Nevertheless, we cannot go along pretending that what universities are doing now makes any sense.